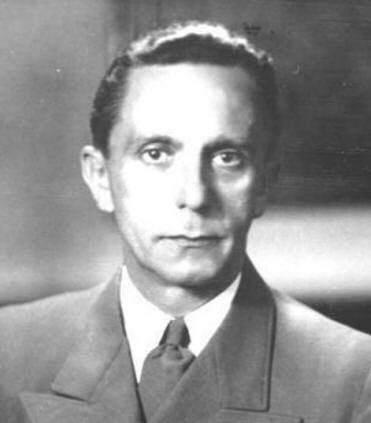 Dr. Paul Joseph Goebbels was Hitler's Minister of Propaganda. Hitler announced Goebbels' appointment on April 27, 1930, in Munich. And what an expert on the matter the man was. According to Ian Kershaw's Hitler, Goebbels "possessed of a sharp mind and biting wit . . . [and was] . . . among the most intelligent of the leading figures in the Nazi Movement." What Did Goebbels Think of Hitler? "He is a genius. The natural, creative instrument of a divine fate... Out of deep distress a star is shining! I feel completely bound to him. The last doubt in me has disappeared." Part of Goebbels' job description was to warm up the crowd. This he did successfully, for example on February 10, 1933, with his opening remarks introducing Adolf's Proclamation to the German Nation, which was Hitler's first speech as chancellor. Here are his words in German: Goebbels' Vorrede zu Hitler's speech Das Deutsche Volk. And Goebbels knew how to get a crowd excited. It was his expertise. Case in point is Goebbels' Do You Want Total War? speech, which he delivered on February 18, 1943, at the Sportpalast at Berlin. This speech is also called the Nation, Rise Up, and Let the Storm Break Loose speech, (Nun, Volk, steh auf, und Sturm brich los!) or the Sportpalast speech. What was going down at the Sportpalast? The slogan of the meeting was Totaler Krieg - Kürzester Krieg, meaning Total War - Shortest War. An audience of approx. 3,000 people went wild. And here is the speech in German - Wollt Ihr Den Totalen Krieg? "Ohne Butter werden wir fertig, aber nicht beispielsweise ohne Kanonen. Wenn wir einmal überfallen werden, dann können wir uns nicht mit Butter, sondern nur mit Kanonen verteidigen." "We can manage without butter but not, for example, without arms. If we are attacked we can't defend ourselves with butter, but only with cannons."